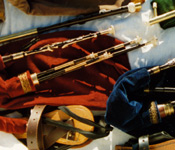 Bagpipes are found in the folk traditions of many parts of the world, and their origins are quite old. We stock the most popular traditional British Isles styles, Northumbrian. Uilleann, and Great Highland. Also practice chanters and reeds.